Founded in 1883, Rosenberg has grown from a town with one hotel, a grocery store and a saloon to becoming the next great escape. Located just 30 miles southwest of Houston at Highways 59 and 36, the City of Rosenberg offers a bounty of antique shops, restaurants, hotels and motels. Local hotels: The Comfort Inn, America's Best Value Inn & Suites, Traveler's Inn, Motel 6, Super 8, and La Quinta are all located near the Fairgrounds. The Hampton Inn and Marriott Spring Hill Suites are located at Hwy 59 and 762 at the Brazos Shopping Center. The Houston Glass Club is proud to announce its 45th Annual Vintage Glass & Antique Show and Sale from 2:00 p.m. to 7:00 p.m. on Friday August 16th, 10:00 a.m. to 5:00 p.m. on Saturday, August 17th and 11:00 a.m. to 4:00 p.m. on Sunday, August 18th at the Fort Bend County Fairgrounds in Rosenberg, Texas. This annual event is the highlight of the year for the glass club and its members. Countless hours go into preparations to make this show a success each year which has become one of the top rated glass shows in the south. Collectors and dealers from all over eagerly anticipate this annual event in order to add special one-of-a-kind treasures to their collections. Over 30 dealers from across the United States will display more than 200 tables of the finest quality glass including: depression era glass, EAPG, American crystal, American dinnerware, kitchenware and pottery. 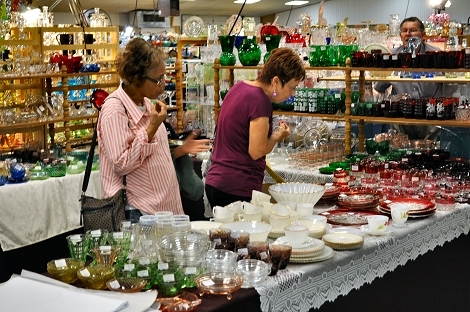 Another aspect in making this event successful has been the well-received general line antique show. This is held in the second building and features selected respected general line antique dealers from around the area. These dealers bring a wide variety of quality items including furniture, jewelry, textiles, linens, silver and more. One never knows what wonderful items will be shown in both shows and everything will be available for sale. Again this year, we are pleased to announce that Leigh Ann Winter from Texas Silver Mercantile will have a booth in the general line show that will include a repair booth. Leigh Ann is a leading silversmith and glass repair expert in this area. She will be available the entire weekend, so customers are invited to bring glass, silver and costume jewelry items with them for repair or receive a consultation on the needed repairs and costs. This is a rare opportunity to get that special family treasure restored. Food concessions are also available on site and will be catered by well-known local caterer, Custom Caterers. The food is so delicious; many customers have made dining part of the show experience! Admission to the show is $10.00 on Friday, $6.00 on Saturday and Sunday, and is good all weekend. Plenty of free parking. The Fort Bend County Fairgrounds are located off Highway 59 South, just ½ mile south on Highway 36. Don’t miss this fun event! For more information, phone 281-240-0382.